On Saturday October 28th, 2017, EscarpAction celebrated the Jessup’s Falls region with an evening of Wine, Cheese and Beer! Along with favourite wines and cheeses, local products were showcased: beer from Casselman’s Cassel Brewery, sheep’s cheese from La Bergerie des Sables in Curran, St-Albert curds, preserves from South Nation Eco Marché, and much more. 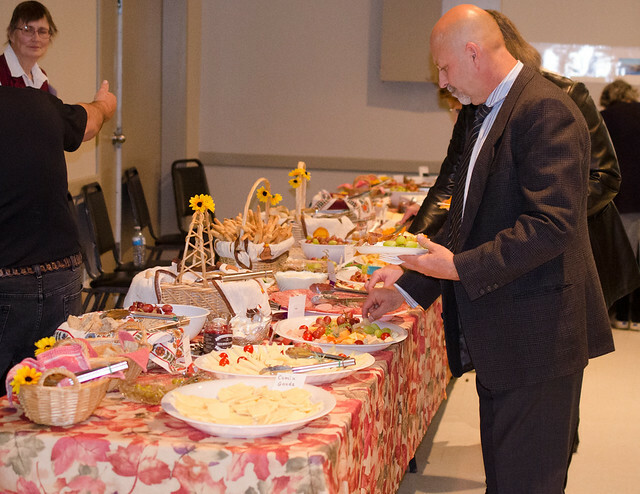 The well-known auctioneer Guy Bissonnette volunteered to liven things up with an auction of goods baked by local chefs, including chef Bruce Wood, artisan baker Louay Ben Messaoud, caterer Imogen Zanetti, and Place 1967’s very own Mme Chénier. Local area artists were also well-represented in a silent auction of artworks by Pierrette Dulude-Bohay, Linda Paquette, Tina Petrovicz, and Suzanne Bohay, among other treasures. Wood crafts also went fast with a miroir and bench by François Delorme being the big ticket items and a sculpture by François Gour collecting multiple bids. Turnout was great with over 200 people, mostly people from across Prescott-Russell but some from as far away as Chesterville and Ottawa, enjoying the activities, the decor, and the good food in the Wendover Community Centre. Thank you to the Alfred-Plantagenet Council for their support and for providing the venue. Thanks also to our musicians, Rod Arsenault and Don and Doris Clairy who gave their time to make our evening more enjoyable. We were delighted to have Alfred-Plantagenet Councillor Jeanne Doucet as our MC and to see Councillor René Beaulne and Mayor Fernand Dicaire joining in the fun. We appreciate the continued support of our awesome community and the generous gift of time, money, and goods from our volunteers, donors, and sponsors. Local businesses stepped up to help us make the evening a rousing success, including La Binerie, Le Chardo, ValuMart Alfred, and Mariposa Farm, to name a few. Leftover food was donated to a community food centre. Find out more about EscarpAction Jessup’s Falls at http://www.escarpaction.ca or write to us at info@escarpaction.ca. See you next year!! Previous Post Events coming together for EscarpAction’s evening of Wine, Cheese & Beer! Next Post Welcome to January 2018 on the escarpment!